(v) the Central Vigilance Commission. The AVD is concerned with the rules and regulations regarding vigilance in public services. The SPE wing of the CBI investigates cases involving commission of offences under the Prevention of Corruption Act, 1988 against the public servants and other misconducts allegedly committed by the public servants having vigilance overtones. The disciplinary authority has the over-all responsibility of looking into the misconducts alleged against, or committed by, the public servants within its control and to take appropriate punitive action. It is also required to take appropriate preventive measures so as to prevent commission of misconducts/malpractices by the employees under its control and jurisdiction. The Chief Vigilance Officer (CVO) acts as a Special Assistant/Advisor to the Head of the concerned Department in the discharge of these functions. He also acts as a liaison officer between the Department and the CVC as also between the Department and the CBI. The Central Vigilance Commission acts as the apex organization for exercising general superintendence and control over vigilance matters in administration and probity in public life. 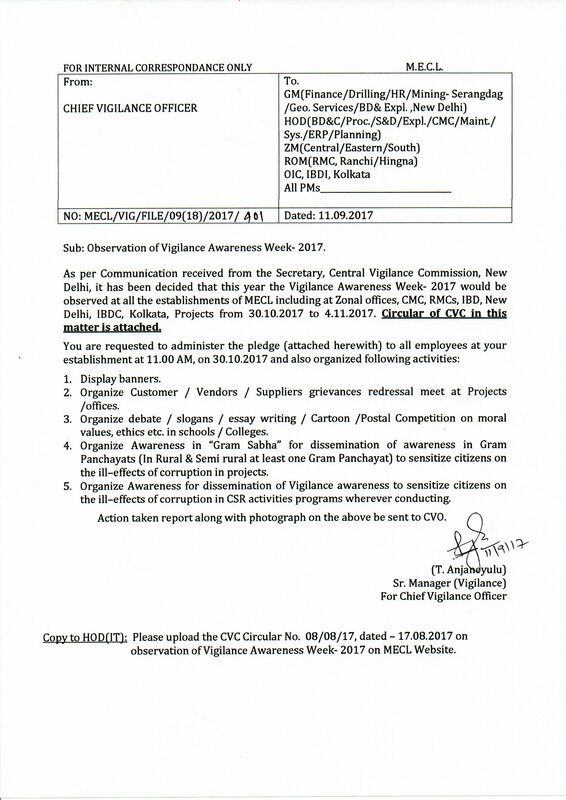 The Vigilance organization at MECL is headed by Chief Vigilance Officer (CVO), Shri Manish Bhimte, who reports directly to the CMD, MECL. The complaints policy followed by the Central Vigilance Commission should invariably be studied before lodging a complaint. Complaints/suggestions, if any, can be lodged through the internet from any where on the web portal of the Central Vigilance Commission of India, at www.cvc.nic.in. Complaints must brief and contain factual details, verifiable facts and related maters. They should not be vague or contain absurd allegations and sweeping statements since these are liable to be filled. Complaints must be brief and contain factual details, verifiable facts and related matters. They should not be vague or contain absurd allegations and sweeping statements since these are liable to be filed. The complaint will generally be acknowledged by the Vigilance Department, but it is not possible to keep the complainant up dated with the status of the case. However the complaints are followed by the Vigilance Department to their logical conclusion. Complaints sent by e-mail will not get an automatic computer generated acknowledgement. The public lodging complaints are also advised not to continue corresponding on the same subject after receiving the acknowledgement from CVO MECL. In case it is found that complaint was false and harassment of officials has been caused, action may be taken against the complainant. The complaint having vigilance angle shall only be examined. The vigilance angle comprises of misuse of official position, demand and acceptance of illegal gratification, cases of misappropriation / forgery or cheating, gross and willful negligence, blatant violation of laid down systems and procedures, reckless exercise of discretion, delay in processing the cases, etc.